There's more to Philly sandwich options than the cheese-steak. 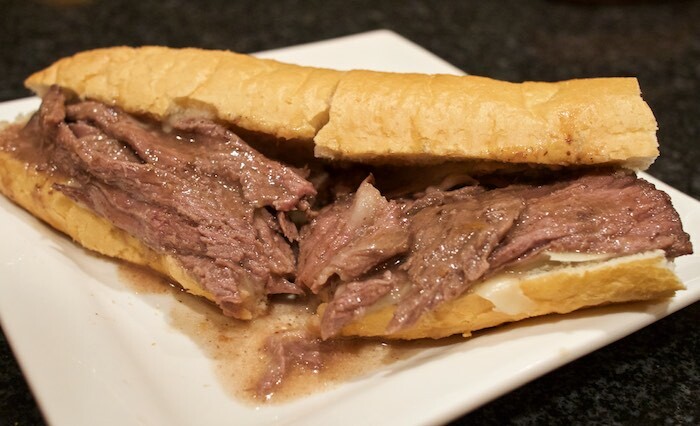 There's the equally well-known Italian hoagie, the roast pork Italiano and the classic roast beef. Served on a soft roll, dripping with beef "gravy" and melting provolone cheese, you can't beat the taste of this Philly favorite. Add onions and carrots to a roasting pan. Season beef with salt and pepper and pat with 2 tablespoons of flour. Place in roasting pan over vegetables and cook at 275 until the meat reaches 140 degrees. Remove meat from pan. Add the rest of the flour and about a cup of water to the juice that is in the pan. Cook until thickened. Strain pressing vegetables with the back of a spoon to extract the juices from them. Season "gravy" with salt and pepper. Slice meat thin and serve in a roll topped with "gravy" and provolone cheese. Since we'll be rooting for the Eagles, I think this roast beef sandwich will be a fitting (and delicious!) meal for Sunday!